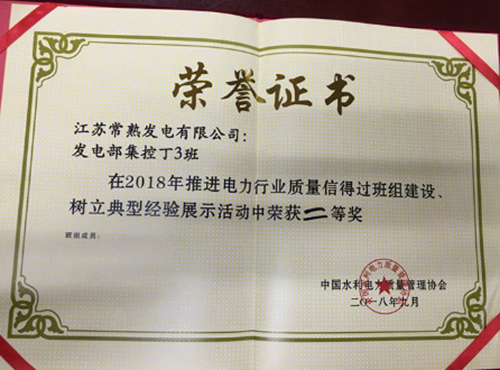 From 17 to 21 September, as a class recommended by Jiangsu’s power industry, the centralised control class D3 of Changshu Electric Power Generating Company won the second prize in the National Power Industry’s 2018 Trustworthy Class Construction and Example Setting event. Changshu Electric Power Generating Company attached great importance to the National Power Industry’s Trustworthy Class Announcement. It organised several discussions and rehersals for every part of the event from deciding report headline and participants to scenario control. It received enthusiastic responses from the audience and eventually won the second prize. The centralised control class D3 consists of 12 employees, who regarded “quality, safety, environmental protection, learning, innovation” as their goals. The class has been named the “first-rated class of the year” for the fourth consecutive year and was dubbed the “class exempted from examination” in 2018. The event, organized by the China Water Resource Electricity Quality Control Association, engaged experts in power industry as the judging penal to evaluate the materials submitted by 124 classes from around China specialising in power generation, power supply and power grid construction.